Last month, the European Parliament took the unprecedented step to initiate what is called the Article 7 process against the nation of Hungary, which if it goes all the way, then it would effectively strip Hungary of its voting rights in the EU assembly. The article has never been previously invoked. 448 Eurocrats voted in favor of the measure, 197 voted against it, and 48 abstained. It was a very, very controversial vote, largely because the EU charter states explicitly (as I understand it at least), that for any vote like this to be ratified, it would have to pass by a two-thirds majority of all members present. In this case with 693 present, 448 is not two-thirds; what they did is they omitted those who abstained from the total, which of course is being loudly denounced by Hungary. The leaders from a number of nations are coming out in complete and total support of Victor Orban and the nation of Hungary, and in so doing, they are representing nothing less than a mass backlash against the globalist policies of the EU. The first one to throw their support behind Orban was of course Poland; Poland is itself going through this sanctions prosses with the European Parliament; a European Commission triggered Article 7 proceedings against Poland last December for reasons very similar to what they are doing here with Hungary. And so, it is no surprise given both their thousand-year historical friendship and their mutual attacks by the EU, it is no surprise that Poland is standing arm-and-arm with Hungary. Poland has officially adopted Viktor Orban’s position that “each EU Member State has a sovereign right to carry out the internal reforms that it considers appropriate.” What happens with the judiciary of a nation, its demographic make-up in terms of immigration rates, its celebration of traditional values and customs, All of that will be decided by the sovereign citizens of that sovereign nation. It is not for a bunch of bureaucratic despots to decree from Brussels. And then, Matteo Salvini, the deputy prime-minister of Italy came out and publicly blasted the Sargentini report, saying that the whole vote to sanction Hungary was nothing more than a cheap political act instigated by a leftwing Europe that has no desire to change, that just wants to hold on to their own power. Salvini made this great quip; “I am convinced that in a few months’ time we will find ourselves governing Europe together with Viktor Orban,” referring to the upcoming European Parliamentary elections in May of 2019. It has been pointed out that both Orban and Salvini are basically implementing identical immigration policies. Orban has cut immigration by 99 percent through the building of a border fence, and Salvini has overseen an 87 percent drop particularly in Libyan migration as the result of his closing Italian ports. Both men are trying to save their nations and indeed European civilization together, and they obviously have developed a kindred spirit. Next to jump on board in defense of Hungary is the Czech Republic, led by Prime Minister Andrej Babis, who called Orban one of his closest allies and friends and denounced the European parliament for its vote to sanction Hungary. What is interesting here is that a number of Czech members of the European Parliament did in fact vote in favor of the sanctions, and so Babis has said that he is going to confront them directly about it. As for Austria, the country is divided here: their rightwing coalition is made up of Chancellor Sebastian Kurz’s People’s Party and Heinz-Christian Strache’s nationalist Freedom Party; Kurz wants Hungary punished for what he sees as Orban’s attempt to manipulate the rule of law in his favor, while Strache wants to see Orban defended. Now, given that Poland, Italy, and the Czech Republic have already pledged to veto any attempt at punishing Hungary, this may just be a bunch of Kabuki political theater. Austria is currently in the role of the EU presidency, so Kurz seems to be towing the line here on behalf of the members of the European Parliament, while Strache is making sure Hungary and the rest of the Visegrad Four know that a major partner in Austria’s ruling coalition supports them. In the midst of this, Orban has actually thrown down a challenge to the French President Immanuel Macron.The Telegraph is reporting that Orban issued a behind the scenes provocation against the French president, basically saying that the upcoming elections in the European Parliament in May basically boils down to a duel between him and Macron. Orban basically said: ‘It is you and me, buddy,’ Merkel’s out. I destroyed her through the whole immigration issue, I came out on top and she fell apart, now I am coming after you. This May, the European Parliamentary elections are coming down to globalism vs. nationalism. And we nationalists are going to win. I think that is why Salvini came out and said that he and Orban would be ruling Europe in a matter of months. In other words, nationalism and patriotism are going to win big in the upcoming election, and these days of corporatist globalists ruling the European Parliament are coming to an end. Now, to be fair, Macron actually came out and responded to Orban’s challenge, and he actually agreed with it; He absolutely agrees that the elections coming up are coming down to what he called a nationalist vs. a progressive vision for Europe. Then he went on to say that he was not going to give an inch to nationalist and those who defend hate speech, and he most certainly is their main opponent. He is not going to give an inch to these mean nationalists who defend hate speech, the horror of horrors. Now, all this underscores, in my view, the importance of process we have talked about before as ‘internationalizing the nationalist right.’ The various nationalist right parties have of course focused primarily on their own local and national elections, but they all recognize that transnational politics, creating alliances between the different nationalist parties, are in many ways just as equally important, because the ultimate adversary in all of this is globalization and the EU, and globalization is by definition transnational. And so, virtually all of the national right organizations out there mobilize beyond just the national level, creating networks with likeminded organizations in other countries. Those networks are coming in quite handy right now for Viktor Orban; I think what we’re going to find from this point forward is that nationalist populist governments like the ones in Hungary and Italy and Poland are going to begin to get even bolder in their reforms, in their consolidation of nationalist, populist, and traditionalist policies in their respective nations, all the while strengthening their coalitions with one another in order to thwart any Brussels-based attempt to stop them, which in many respects will have effectively neutered Brussels from enforcing its will on European member-nations. It is going to be very, very fascinating to watch, especially in light of the upcoming elections. As I said before, I really do not know what the European Parliament was thinking here; all they seem to have done is galvanized the nationalist populist parties throughout Europe to rally around Hungary, making Viktor Orban even MORE popular; I think it was a huge miscalculation and may end up costing them dearly in May’s election. 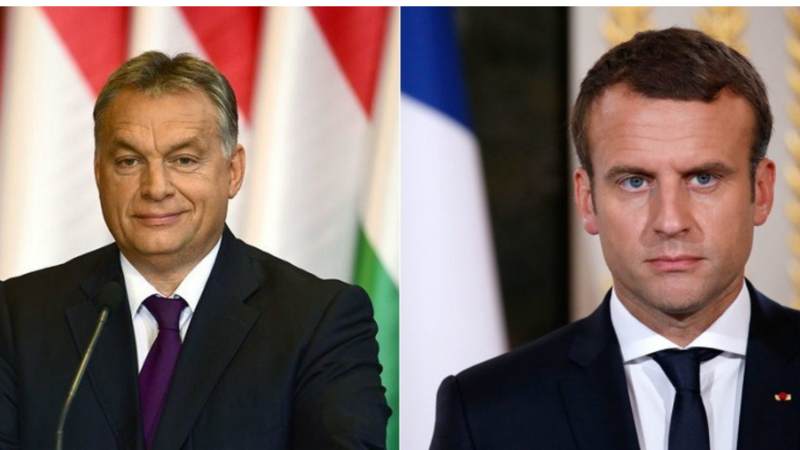 We will certainly be keeping an eye on things, but in terms of the challenge that is been issued by Orban to Macron, if Macron’s response is any indicator, globalists are in for one very, very disappointing election.